LONDON--(BUSINESS WIRE)--Technavio’s latest market research report on global laboratory analytical instruments and consumables market provides an analysis of the most important trends expected to impact the market outlook from 2018-2022. Technavio defines an emerging trend as a factor that has the potential to significantly impact the market and contribute to its growth or decline. 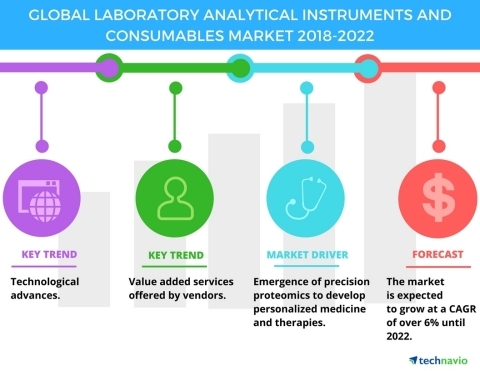 According to Technavio analysts, the global laboratory analytical instruments and consumables market will grow at a CAGR of over 6% during the forecast period. The emergence of precision proteomics to develop personalized medicine and therapies is a major factor driving the market’s growth. Proteomics has given researchers the opportunity to develop personalized medicines as protein structures have revealed greater insights into disease mechanisms which can be acted upon to develop personalized therapies. The evolution in technology and the growth of nano-technology has had a significant impact on the growth of the market. For instance, in the last few years, molecular spectroscopy has witnessed an extension in its applications. This increase in applications of spectroscopy has prompted vendors in the market to improve their existing instrumentation and develop new products based on the changing needs of customers. For instance, recent advances in Raman spectroscopy include non-invasive diagnosis of bone disease and monitoring of glucose levels. Similar advances in mass spectrometric instruments have yielded results with advantages such as sample throughput, detect sensitivity, mass accuracy. Also, mass spectrometers in combination with spectrometers such as MALDI-TOF MS and MALDI QqTOF have made it easier for users to identify thousands of proteins daily. This market research report segments the global laboratory analytical instruments and consumables market by application (element analysis, separation analysis, and molecular analysis) and key regions (the Americas, APAC, and EMEA). In 2017, the element analysis instruments segment led the global laboratory analytical instruments market with a 36% share because of its wide range of applications. The element analysis instruments were followed separation analysis instruments and molecular analysis instruments owing to the increase in adoption of these instruments by biotechnology and pharmaceutical sectors. In 2017, the Americas dominated the market with a 36% share owing to the presence of many big pharmaceutical companies that use several kinds of laboratory instruments for disease diagnosis and drug development. The Americas was followed by EMEA and APAC owing to the increase in research related to several diseases including cancer. Technavio’s market research report on global laboratory analytical instruments and consumables market analyses the key trends and drivers.